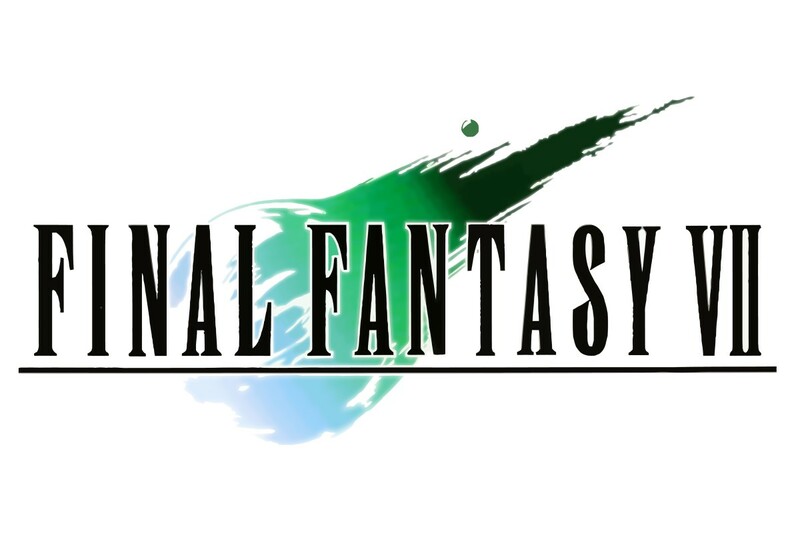 Final Fantasy VII was originally released in 1997 for the PlayStation and was a huge hit and a welcomed change to what gaming was at the time. FFVII become the backbone for what most RPG's are today. With its illusive turn-based strategy and Open World synergy, made this came one of the most loved console games of its time. FFVII is based on the journey of Cloud Strife. A former member of SOLDIER, Cloud joins a group called Avalanche at the beginning of the game. Their mission is to shut down Mako Reactors because they are killing the planet. This ends with the group leaving their home to enter the vast world to track down an enemy called Sephiroth and find the Temple of the Ancients. 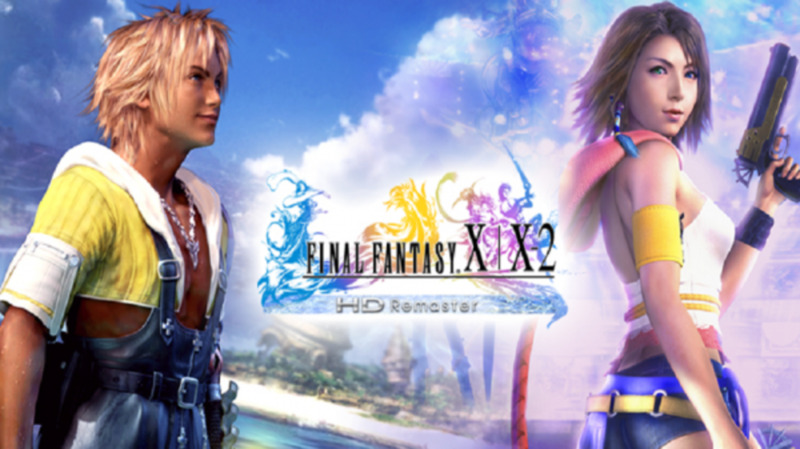 Cloud is joined by various loveable characters each with their own background history which is told within the game. 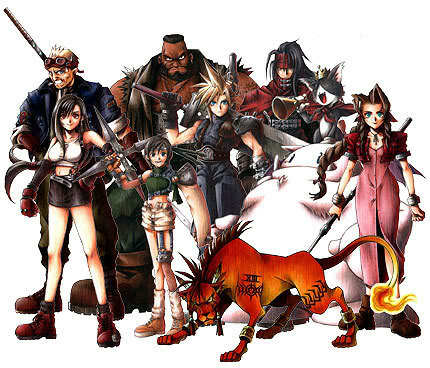 So within FFVII, there are 9 characters to swap around and play with. When in the open world after reach a place called Gold Saucer, you get giving a gift called a buggy and also a function called 'PHS'. This is basically a team management system that lets you swap around your players when in the open world or at save points throughout the game. Cloud Strife: His home town is Nibelhiem. A former member of Shinra's military organisation called Soldier. Uses a Sword to do his attacks. Barret Warren: Home town of Mount Corel mining town. Group Leader of Avalanche in Midgar. Uses a rifle arm to do his attacks. Tifa Lockheart: Home town of Nibelhiem and Cloud's childhood friend. Also a former member of Avalanche and owns her own bar in Midgar called 7th Heaven. Uses her fists to attack her enemies. Aerith (Aeris) Gainsborough: A flower girl in Midgar and joins the party when Cloud is in Sector 5. Is the last known living Cetra which Jenova drove to extinction. Uses long Rod to attack her enemies and is the major healer through limit breaks, for the party. Red XIII: Discovered in the Shinra Building in Midgar but from Cosmo Canyon. Wants to be the protector of Cosmo Canyon and also is the last of his kind. Uses Headdresses to attack his enemies. Cait Sith: Discovered in Gold Saucer. A cat sitting on top of a stuffed white Moogle. Posing as a fortune teller when you first meet. Is very intelligent and knows a lot of information about the Shinra organisation. Uses megaphones to attack his enemies. Cid Highwind: Discovered in Rocket Town. Is knowledgeable about aircraft's and has a grudge against the Shinra for cancelling its space program. Uses Javelins and Lancer to attack his enemies. Vincent Valentine: Discovered in a coffin in the Shinra Mansion in Nibelhiem. Used to be part of the special ops team in Shinra's organisation called 'The Turks.' Uses guns to attack his enemies. Yuffie Kisaragi: Found in forest scattered around the world. Highest % to get her in forests near Junon. Home town of Wutai. 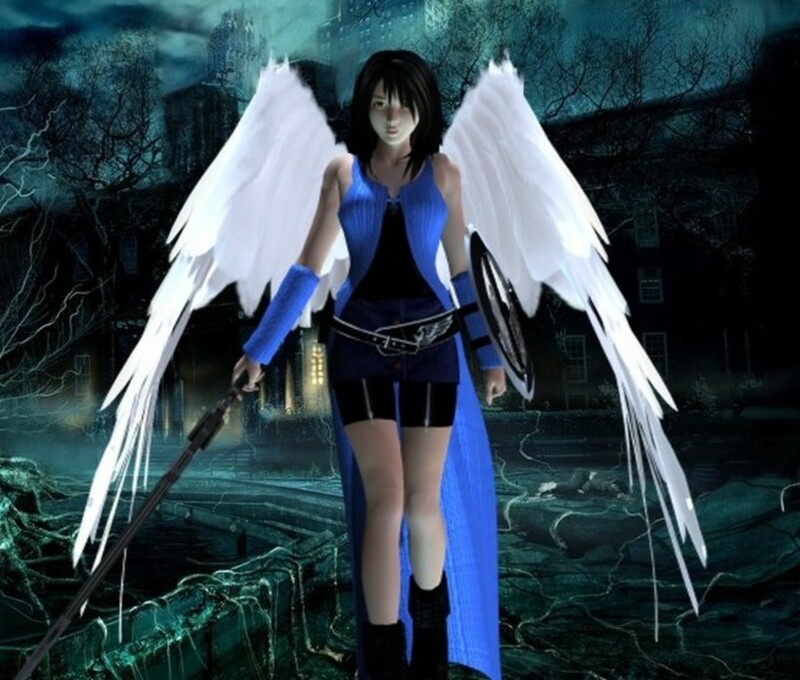 She aims to restore her home town to its former glory before the Shinra conquered it. Uses Boomerangs to attack her enemies. Some of these characters you don't meet until later in the game. There are many different types of Materia in Final Fantasy VII that do different things. Some help to kill or inflict high damage to enemies and some aid the party by healing and taking away negative status effects. All Materia can be used in some way during a battle and can also be levelled up to make it stronger. Green Magic Materia: If you select a character to equip this colour Materia, it unlocks the ability to use spells like Lightning and Fire magic but also Restore and Life magic. 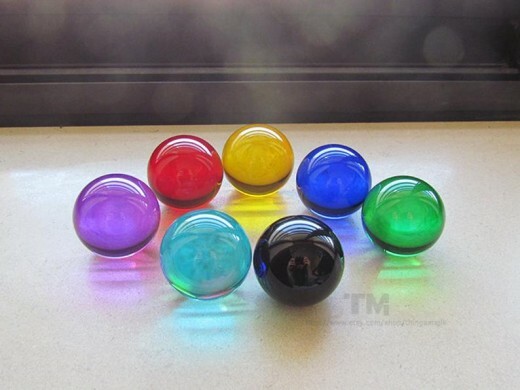 These can all be used inside a battle, but magic like Restore Materia can be used to heal the team outside of a battle. Blue Support Materia: Can be paired with another type of Materia like magic Materia, to give benefits from its effects. This can only be applied when 2 slots on your weapons or armour are joined together. Yellow Command Materia: Enables a new category to choose from in the battle menu enabling more attack options or chances to steal something. For example, Steal Materia is classed as Command, meaning it would come under this category. Purple Independent Materia: Does not need to be paired with any other Materia and gives added effects straight away. For example Cover Materia, when equipped to a character, enables that character to take hits instead of the targeted character. Red Summon Materia: A summon is a more powerful spell. Brings forth mythical beings and monsters to inflict high damage to enemies using various elements. For example, if Ifrit Materia is used during battle, this monster would use fire to attack whereas Alexander Materia would use Holy type magic to inflict damage on its enemies. Materia uses a levelling up system to make its attacks stronger. For instance: Lightning Magic starts at level 1 called Bolt. You then require so much AP (Ability Point) to level up that Materia. This is earned through killing enemies and vary's how much you get from each enemy you kill. 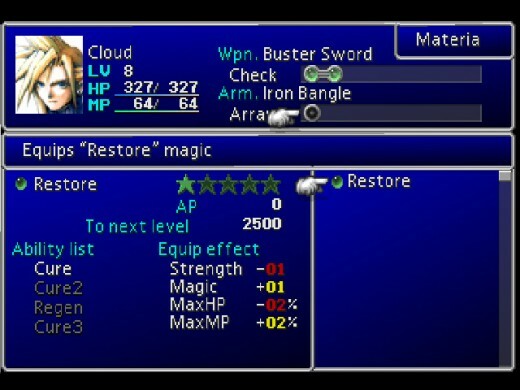 A picture is attached below for example purposes based on Restore Materia. Limit Breaks are essentially an Ultimate Skill each Character has and can be obtained by receiving damage from enemies. The pink bar in the battle screen fills up over time and when at max will show rainbow colours identifying that your Limit Break is ready to use for that character. Each character has their own Limit Break and using them a certain amount of times and killing enemies with them, will allow you to learn the next Limit Break and then Learning Higher level Limit Breaks which inflict more damage on the enemy. Each level of Limit Breaks has 2 to master before you can gain the next level except for the Level 4 Limit Break. This is only gained after achieving all other Limit Breaks and taking certain steps in the game to obtain them. For example; to obtain Barret Wallace ultimate Level 4 Limit Break, you have to Stop the train before it hits Mount Corel on Disc 2. Vincent Valentine, however, only has 1 Limit Break per level, but takes slightly longer to achieve each Level. Also, Cait Sith only has 1 Limit Break to achieve. For example, Cloud Strife level 1 limit break is called Braver. This is the first Ultimate you get to use. To get the next level, he has to use Braver 8 times in battles to get Level 1.2 Limit Break called Cross-slash. 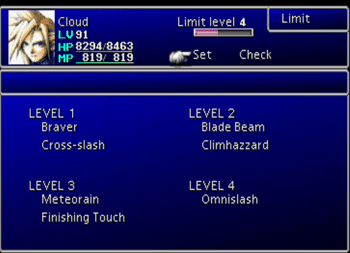 Then to get to Level 2 Limit Break, Cloud then has to defeat 80 enemies by any means. This could be by using magic, Materia or melee attacks. This will then grant him to Blade Beam Limit Break as Level 2. A picture below will show this. This goes for all characters apart from the 2 stated above. What New Additions Are There? With the release of the Xbox version, they have added new helpful, but some would say cheats, to the game. They don't give you the ability to have max Gil (currency) or to have mastered every marteria, but they do allow you to have 3x Speed in movement and battle speed. Turn on No Encounters when moving around the world and areas and also battle enhancement mode. 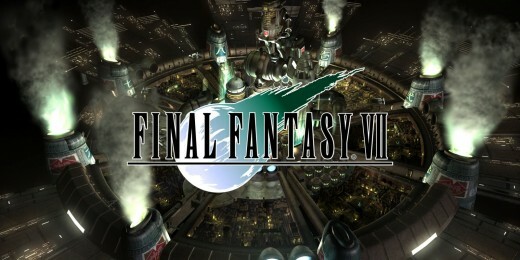 Final Fantasy VII for me is one of the greatest games of all time. 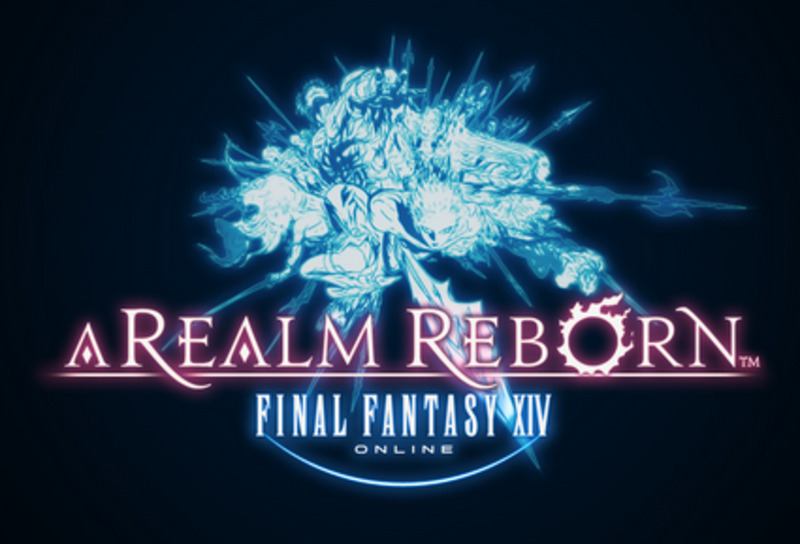 Even though it is a 20+-year-old game, for it to be re-released on Xbox has brought back all those wonderful childhood memories of playing it till the early hours grinding those levels out to master the Materia, obtain those Level 4 limit breaks and so on. This game can absorb your time making you spend hundreds of hours on it doing little side quests, the main story and much much more. I didn't even talk about the Chocobo Ranch or obtaining a Gold Chocobo. But anyway enough from me, let me know your thoughts about this game below. Have you played this whether you picked it up now or played it when it first came out? Let me know in the comments below. I believe some games are already being ported to New Gen consoles like Resident Evil 2 for instance. I will in due course get around to playing them with the new updated graphics. Hold the phone... I thought we were supposed to be getting the Resident Evil 2 treatment but with FFVII? Don't get me wrong, I'm hyped to play FFVII on anything other than a PS1, but why won't they just re-imagine it with modern graphics already, I mean, if they're up to the challenge that is. But in anycase, great, informative article, man.